No one likes being called a moron. So when faced with an app called The Moron Test, you have to take it right? It’s just sitting there, challenging you to prove yourself. And like the predictable human you are, you cave and launch DistinctDev’s infamous game app. The Moron Test consists of a fast-paced barrage of questions that are seemingly simple, but in actuality require the use of your gray matter. There are three full sections, each with over 100 questions (that makes over 300 questions in all, for those who are mathematically challenged). In these three sections, there are seven levels ranging from Moron to Genius; obviously you work your way from one to the other. Question after question will present themselves: you are to follow instructions or be taken back to the very beginning of the level. Take it from me, it’s frustrating when that happens. Be sure to clear your schedule for the next half hour or so, because once you settle in to play, you won’t be stopping–this game inspires a real drive to get to the finish line. (Even more sections are to be added, according to the developers.) There are dozen of question types, which requires you to be quick and attentive, so bring your A-game to the table to show that you, indeed, are not a moron. The graphics, sound effects, and soundtrack are quirky and delightful, perfect accompaniment for such a game. Half the fun is in finishing the game; the other half is in smugly watching everybody you know stumble their way through the same game….if only school were this fun. 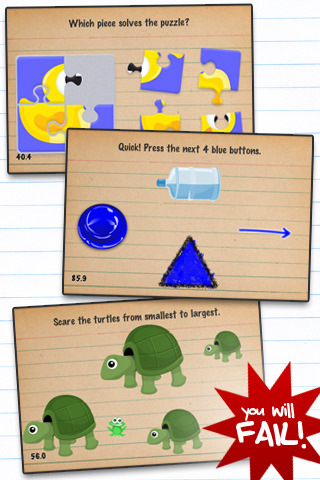 AppSafari review of The Moron Test was written by Julie Guan on April 25th, 2010 and categorized under App Store, Featured, Fun, Games, Mini Games, Strategy. Page viewed 4057 times, 1 so far today. Need help on using these apps? Please read the Help Page.